Recently, Palomar technologies attended Semicon China in Shanghai and the OFC Show in San Diego, CA. The following are our impressions of trends and events at these shows. We review that visit together with the launch of our new high accuracy die bonder, the 6532HP. The views represented are entirely those of the authors, Dr. Anthony O’Sullivan of Palomar Technologies Inc., and Rich Hueners, Vice President Global Sales and Managing Director Palomar Technologies (SE Asia) Pte Ltd. Both Rich Hueners and Dr O’Sullivan will gladly field questions and comments. 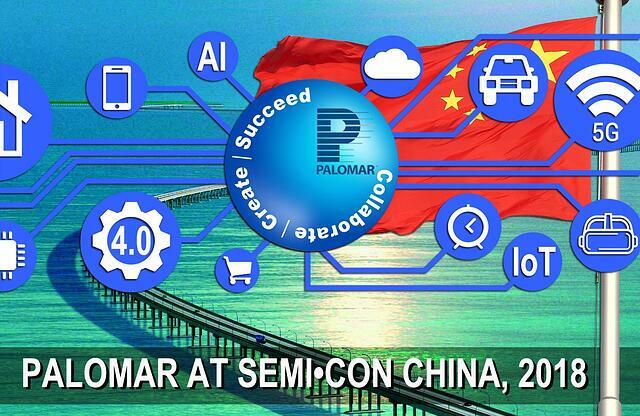 Palomar Technologies at Semicon 2018, Shanghai, China. There is a clear similitude between the micro-electronic packaging business and the many tributaries flowing into the mighty Yangtze river, which then melds into a wide and diverse ecology of many bays and islets. Packaging itself being represented by the wonder that is the great Donghai Bridge (pictured above) as the one necessary process that connects them all. This particular metaphor could not represent a more appropriate beginning to our narrative on Palomar’s presence at Semicon 2018 in Shanghai. To say that we were pleased with the reception given to our new 6532HP bonder would be to undersell ourselves. We could give you a catalogue list of its great benefits, yet for us, what assures that this is the right product at the right time, is so much more than mere data on a page. After all (and to be brutally honest) the 6532HP deconstructed into what it can “do” and looks like, reduces it to just another high-tech bonder. A more truthful presentation would liken it to a carefully crafted jigsaw piece, designed to fill its perfect place in the synergy that is the micro-electronic-packaging ecosystem. For example, the 6532HP purposefully anticipates an ever diversifying array of materials, as equally, the growing complexity of software. Most especially included are new application opportunities using different silicon compounds in opto-electronics, and new ranges of GaN substrate, including diamond, in RF packaging. A number of our colleagues were impressed with a presentation given by Alpha & Omega Semiconductor using a technology called “shielded gate transistor” that stretches the abilities of silicon beyond traditional limits. With GaN having 10x in power density and 1/7 the size of LDMOS, we have to consider GaN a serious contender for the C-bands 30, 40 and Sub-6 spectrums. In fact, data was presented showing GaN on Si exceeded the best performance criteria of LDMOS. We know MACOM has made similar proposals of GaN on Si parity (vs. GaN on SiC) with their MagB product. If this proves commercially viable, the result will be technically superior and very cost competitive range of GaN on Silicon power devices. We could not help noticing that one of their most well-known competitors is still working with GaN on SiC. The latter raises a critical question of who is on the right path? Half of the speakers advocated GaN on Si, and the other half GaN on SiC for the same end uses. We can conclude then, at least at this time, the jury is still out on which will reach the dominant market position and ultimately phase out LDMOS technology over time. Dr. Andrew Nelson from iQe stated unequivocally our own view that “the future will be material led.” He went on to say that market disruption will happen through material innovations and higher levels of integration. This squares precisely with our own discussions with academic researchers at world-class universities and research institutions. Success here, would, of course, have a big impact across the sector, as would the conclusion of another great vision; the complete replacement of copper with optics. While current costs are a challenge, if it can be done with HDMI cables then the direction of the technology is clearly one way. Add to this the incessant demand for speed and bandwidth which will be significantly exacerbated with the roll-out of 5G (and all the IoT and SMART devices it will facilitate) and, as they say, “the writing is on the wall”. Not surprisingly, our greatest interest was captured in the many conversations we had on the subject of packaging. In many sectors this is, and remains, the most expensive process in device manufacturing. Intense competition means a slew of innovations aimed at reducing costs. Not that it is this simple and it’s not just a question of the same for less, but of far more, for far less. More speed, precision and reliability at significantly less cost per unit. Yet, it is not just manufacturers who are being challenged, but the laws of physics themselves. If Moore won’t budge, we are at least trying to find ways of his bending the rules for us. Thus, across the sectors, companies are experimenting with novel ways to integrate the packaging, many of them working directly with the foundries. One of the questions we always get on our return from events like Semicon China is, “So, what was new?” Of course, there were lots of new things, but frankly new things are not new. Indeed, on occasion new things can be a distraction. What was new this year was convincing anticipation. Previously we have had hyperbole, buzz, expectation, talk, but this year there was an undoubted sense of intelligent anticipation built on the foundation of the tangible. 5G is no longer only an “if” that never comes, but an “already here”. Within two years high-speed, low latency will be accessible in countries accounting for well over half the world’s population. Of that over sixty per cent will be in Asia. 5G is paving the way for electric and autonomous drive vehicles, and the extensive infrastructures to support them (already in construction across much of Europe). In April and October 2017 two new SMART cities were announced, representing a combined investment of over $1 trillion dollars. There have also been a series of announcements from the big six tech/web companies that point to some $250 billion in investment between 2018 and 2023. The clear aim is to make a resounding success of 5G. Furthermore, the upgrades represented by 4.5G and 4.9G are anything but marginal. These are real dollars that are already driving demand. Here is a small but significant example: Volume of shipments of laser diodes over the past two months were greater than the total number of laser diodes shipped since they were invented in the late 1960s! That is remarkable! There is no issue with producing these laser diodes, but their volume points to increasingly pressing issues of scalability and cost (which we anticipate my readers would identify) but also hybridization. In other words, the pressure is now of for creative blends of legacy technologies with novel approaches. Which brings us back to Palomar’s 6532HP. As we said in our opening remarks, it is a machine whose design goes far further than completing a cold list of features and benefits. It is a machine designed to fit in with the fluid demands—and dynamic minds—of an evolving era. While this includes solid engagement with the contemporary optical market (with the machine’s ability to handle wafers and ultra-high placement accuracy) it serves a far wider sector. Yes, it is designed to provide production value and “cost per bond” effectiveness. Yes, we are intimately aware that our customers face relentless cost pressures, so our machine yields the best cost-of-packaging value. The greatest asset, however, is that the 6532HP possess an agility to meet a wide range customer needs supported by a world-class, globally based team combining engineering and process expertise.